In a stunning moment that he will never forget, this country legend was brought to the verge of tears as he looked on, watching two of his close friends absolutely dazzle the crowd with one of his biggest hit songs. Originally released in November 1984, Willie Nelson and Ray Charles stormed the charts with their timeless signature duet, “Seven Spanish Angels” and the world of music hasn’t been the same since. Taking the No. 1 chart position, this undeniable classic soared high and spent a total of 12 weeks on the chart – cementing it as the biggest country success of Charles’ career and an absolute staple in Nelson’s repertoire. 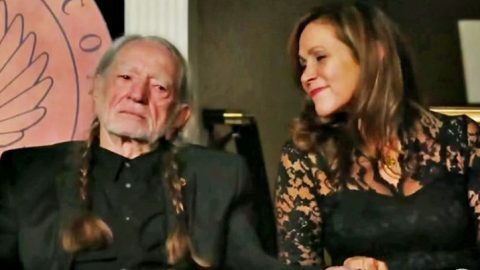 The evening of the Gershwin Prize Awards Ceremony was one that the one and only Nelson will never forget and some of country music’s most iconic people came out in honor of the man that has impacted millions with his treasured music. Presented by the Library of Congress, November 18th, 2015 will forever remain an incredible day in country music history after honoring Nelson with an award that recognizes a standard of excellence in music not often achieved. Taking the stage to perform one of Nelson’s most loved hits and a country classic that has stood the test of time, two of his close friends, Alison Krauss and Jamey Johnson bear their souls through an iconic cover of his treasured hit. This performance had Nelson choked up and visibly moved by emotion as he exchanged a loving glance with his wife, Annie D’Angelo. It’s in this moment you can see exactly how much this tribute means to them. Watch the video below of Krauss and Johnson pouring their hearts out in a moving tribute to one of country’s living legends.